Stuart's hardware is the largest independent Calor Gas dealer in Calderdale supplying over 1000 bottles per month to every part of the district. With two vehicles available 6 days per week we aim to fill all orders placed before 12 noon the same day although for the outlying areas we operate a schedule of deliveries. As a small business we are flexible enough to cope with most demands and will try and help whatever the circumstances. We carry all varieties of bottled gas for heating products - the main being Butane which comes in the blue bottles. Suitable for caravans and small mobile heaters is the 7 Kg size whilst the 12 and 15 Kg sizes are used in the larger mobile heaters. Propane (the red bottle) is also available in 3.9 and 6 Kg sizes for caravans and blowtorch use; in 13 and 19 Kg sizes for catering vans and small industrial heaters and in the larger 47 Kg size for large industrial heaters or for domestic uses where no mains gas is available. We also carry gas for use in Fork Lift trucks and can offer regular deliveries to suit your schedules so that you never run out of gas and you never need to pick up the phone. A recent addition to the market is 'Alfresco Gas' which is in a green bottle. This is propane and is used in specialist applications such as patio heaters, barbecues and midge eaters. Connected to the appliance without the need for spanners this gas is limited in availability in the area and we are pleased to be able to offer it to our customers. Help and advice on gas delivery or products is always available please phone 01422 351926 and any of the team will be able to assist you. For interior applications we can supply board and finishing plaster, plasterboards, dry lining and insulation materials and the fastenings to put them up. Stuarts Hardware are proud to be stockists of Liberon products as we believe that they offer the best in wood care and finishing products. We stock the most comprehensive range of their products and are the largest supplier in West Yorkshire. 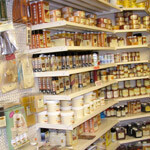 Their range of dyes, stains and polishes are always available as well as their oils and waxes. We also stock Liberon restoration products and can assist with the selection of the right item for your project, whether you are refurbishing an antique or removing white marks from table tops we have just the right item for the task. We also stock Briwax and Blackfriars products to compliment the range of wood finishing items and offer a testing service so that the right shade and finish can be obtained. 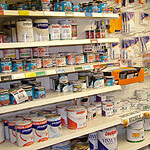 As well as stocking primer, undercoat and gloss paints for wood we also stock emulsion paints such as Johnstone & Leyland.Available in a range of finishes we have just what you need and in sizes that means you don't have to buy more than you need. We are your local premier toolbank store. We are part of a nationwide chain of over 1000 specialist tool stores, backed by daily deliveries from a central depot. Hand tools. Power tools. Specialist tools. Everyday tools. Sets of tools. Boxes to keep tools in. Garden tools. Building tools. We stock safety equipment as well (for when you are using the tools you have bought). Glasses, boots, gloves, hard hats, high visibility vests. If you need a tool we have it in stock or can get it at competitive prices. Why not call and see us next time you are starting a project around the home we can help with all your needs. For traders we offer an account system (subject to checks of course) and can arrange for deliveries direct to site.